AM Golden Accountancy Corporation wanted to reach its potential audience online. To address that issue, we did a complete website overhaul. We wanted to write copy that would accurately target potential clients based on key phrases people search for. Our objective was to promote the companies’ many services and let people know that AMG is a full service CPA firm, specializing in CFO Services, Mergers & Acquisitions, Valuation Services, Forensic Accounting, Divorce & Family Law, Expert Witness, Accounting & Taxes and Fraud Prevention. 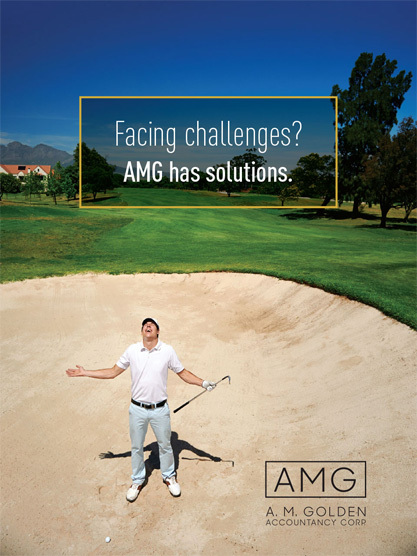 To supplement the website’s relaunch, we purchased an ad in a local golf publication and produced creative that would specifically speak to the publication’s core demographic.